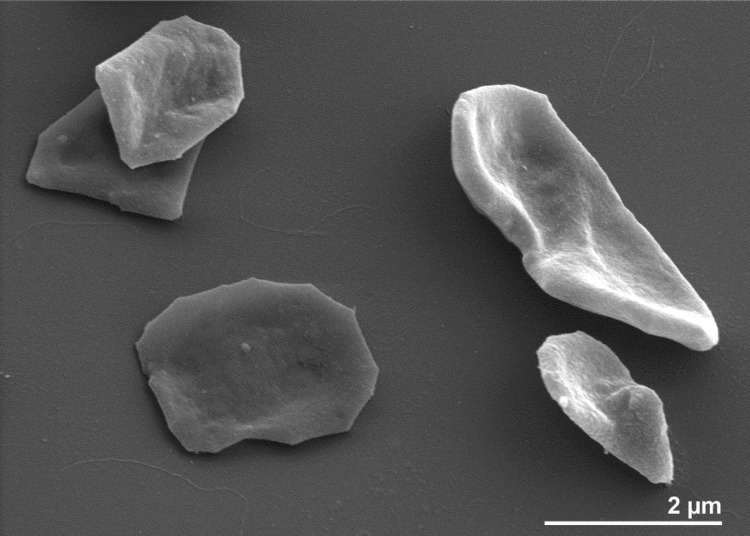 Methanoplanus limicola Wildgruber et al. 1984 is a mesophilic methanogen that was isolated from a swamp composed of drilling waste near Naples, Italy, shortly after the Archaea were recognized as a separate domain of life. Methanoplanus is the type genus in the family Methanoplanaceae, a taxon that felt into disuse since modern 16S rRNA gene sequences-based taxonomy was established. Methanoplanus is now placed within the Methanomicrobiaceae, a family that is so far poorly characterized at the genome level. The only other type strain of the genus with a sequenced genome, Methanoplanus petrolearius SEBR 4847T, turned out to be misclassified and required reclassification to Methanolacinia. Both, Methanoplanus and Methanolacinia, needed taxonomic emendations due to a significant deviation of the G+C content of their genomes from previously published (pre-genome-sequence era) values. Until now genome sequences were published for only four of the 33 species with validly published names in the Methanomicrobiaceae. Here we describe the features of M. limicola, together with the improved-high-quality draft genome sequence and annotation of the type strain, M3T. The 3,200,946 bp long chromosome (permanent draft sequence) with its 3,064 protein-coding and 65 RNA genes is a part of the Genomic Encyclopedia of Bacteria and Archaea project. The single genomic 16S rRNA sequence of M. limicola M3T was compared with the Greengenes database for determining the weighted relative frequencies of taxa and (truncated) keywords as previously described . The most frequently occurring genera were Methanoculleus (51.9%), Methanoplanus (18.5%), Methanogenium (16.8%), Methanosphaerula (5.3%) and Methanomicrobium (3.7%) (52 hits in total). Regarding the two hits to sequences from members of the species, the average identity within HSPs was 99.9%, whereas the average coverage by HSPs was 92.8%. Regarding the five hits to sequences from other members of the genus, the average identity within HSPs was 96.6%, whereas the average coverage by HSPs was 95.0%. Among all other species, the one yielding the highest score was M. endosymbiosus (FR733674), which corresponded to an identity of 99.5% and an HSP coverage of 99.7%. (Note that the Greengenes database uses the INSDC (= EMBL/NCBI/DDBJ) annotation, which is not an authoritative source for nomenclature or classification.) The highest-scoring environmental sequence was EU420694 ('Archaeal and Kao-Mei Wetland clone KM07-Da-3'), which showed an identity of 95.7% and an HSP coverage of 98.0%. The most frequently occurring keywords within the labels of all environmental samples which yielded hits were 'temperatur' (4.7%), 'bioreactor' (4.4%), 'anaerob' (4.0%), 'methanogen' (3.3%) and 'archaeal' (2.9%) (198 hits in total) fit to the features known from the habitat of strain M3T. Environmental samples which yielded hits of a higher score than the highest scoring species were not found. Phylogenetic tree highlighting the position of M. limicola relative to the type strains of the other species within the family Methanomicrobiaceae. The tree was inferred from 1,271 aligned characters of the 16S rRNA gene sequence under the maximum likelihood (ML) criterion and rooted as previously described . The branches are scaled in terms of the expected number of substitutions per site. Numbers adjacent to the branches are support values from 250 ML bootstrap replicates  (left) and from 1,000 maximum-parsimony bootstrap replicates  (right) if larger than 60%. Lineages with type-strain genome sequencing projects registered in GOLD  are labeled with one asterisk, those also listed as 'Complete and Published' with two asterisks [11-14] (for Methanoregula boonei and Methanosphaerula palustris see CP000780 and CP001338, respectively). 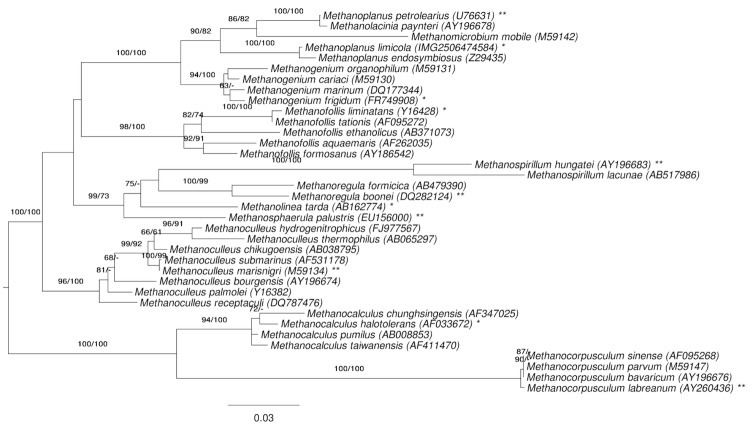 The tree depicted in Figure 1 reveals discrepancies between the current classification of the group and 16S rRNA phylogenetic analysis, as the genus Methanoplanus appeared polyphyletic, with M. petrolearius appearing as sister group of Methanolacinia payntneri with maximum support. We conducted a constraint analysis as previously described , enforcing the monophyly of all genera (which only affects Methanoplanus in this dataset, see Figure 1). The best-known ML tree had a log likelihood of -7,097.90, whereas the best tree found under the constraint had a log likelihood of -7,144.12. The constrained tree was significantly worse than the globally best one in the Shimodaira-Hasegawa test as implemented in RAxML  (α = 0.01). The best-known MP trees had a score of 1,090, whereas the best constrained trees found had a score of 1,115 and were significantly worse in the Kishino-Hasegawa test as implemented in PAUP*  (α = 0.01). M. limicola strain M3T, DSM 2279, was grown anaerobically under H2/CO2 gas phase in DSMZ medium 141 (Methanogenium medium; MMG medium + 0.1% acetate; substrate: H2 or formate; stimulated by YE or peptone, + vitamins)  at 35−40°C. DNA was isolated from 0.5-1 g of cell paste using MasterPure Gram-positive DNA purification kit (Epicentre MGP04100) following the standard protocol as recommended by the manufacturer with modification st/LALM for cell lysis as described in Wu et al. 2009 . DNA is available through the DNA Bank Network . The genome was sequenced using a combination of Illumina and 454 sequencing platforms. All general aspects of library construction and sequencing can be found at the JGI website . Pyrosequencing reads were assembled using the Newbler assembler (Roche). The initial Newbler assembly consisting of 760 contigs in ten scaffolds was converted into a phrap  assembly by making fake reads from the consensus, to collect the read pairs in the 454 paired end library. Illumina GAii sequencing data (3,470.2 Mb) was assembled with Velvet  and the consensus sequences were shredded into 1.5 kb overlapped fake reads and assembled together with the 454 data. The 454 draft assembly was based on 332.3 Mb 454 draft data and all of the 454 paired end data. Newbler parameters are -consed -a 50 -l 350 -g -m -ml 20. The Phred/Phrap/Consed software package  was used for sequence assembly and quality assessment in the subsequent finishing process. After the shotgun stage, reads were assembled with parallel phrap (High Performance Software, LLC). Possible mis-assemblies were corrected with gapResolution , Dupfinisher , or sequencing cloned bridging PCR fragments with subcloning. Gaps between contigs were closed by editing in Consed, by PCR and by Bubble PCR primer walks (J.-F. Chang, unpublished). A total of 159 additional reactions were necessary to close some gaps and to raise the quality of the final sequence. Illumina reads were also used to correct potential base errors and increase consensus quality using a software Polisher developed at JGI . The error rate of the final genome sequence is less than 1 in 100,000. Together, the combination of the Illumina and 454 sequencing platforms provided 867.9 x coverage of the genome. The final assembly contained 421,665 pyrosequence and 44,481,858 Illumina reads. The G+C content is 39-42%. The G+C content is 45-47%. We would like to gratefully acknowledge the help of Evelyne-Marie Brambilla (DSMZ) for DNA extractions and quality control. This work was performed under the auspices of the US Department of Energy Office of Science, Biological and Environmental Research Program, and by the University of California, Lawrence Berkeley National Laboratory under contract No. DE-AC02-05CH11231, Lawrence Livermore National Laboratory under Contract No. DE-AC52-07NA27344, and Los Alamos National Laboratory under contract No. DE-AC02-06NA25396, UT-Battelle and Oak Ridge National Laboratory under contract DE-AC05-00OR22725, as well as German Research Foundation (DFG) INST 599/1-2. AL was in part supported by the Russian Ministry of Science Mega-grant no.11.G34.31.0068; SJ O'Brien Principal Investigator. The Council of Scientific and Industrial Research (CSIR, India) and DAAD, Germany, provided a Fellowship to Shanmugam Mayilraj. Huber H, Huber G, Stetter KO. Genus VI. Methanoplanus Wildgruber, Thomm and Stetter. 1984, 270VP (Effective publication: Wildgruber, Thomm and Stetter in Wildgruber, Thomm, König, Ober, Ricchiuto and Stetter 1982, 36). In: Boone DR, Castenholz RW, Garrity (eds): Bergey's Manual of Systematic Bacteriology, second edition, vol. 1 (The Archaea and the deeply branching and phototrophic Bacteria), Springer-Verlag, New York, 2001, pp. 259-261..
Garrity GM, Bell JA, Lilburn T. Taxonomic outline of the Procaryotes. In: Garrity GM, Bell JA, Lilburn TG (eds), Taxonomic Outline of the Procaryotes, Bergey's Manual of Systematic Bacteriology, Second Edition. Release 4.0, Fourth Edition, Springer-Verlag, New York, 2003, p. 1-39. Forterre P, Gribaldo S, Brochier-Armanet C. Natural history of the archaeal domain. In: RA Garrett & HP Klenk (eds) Archaea: evolution, physiology, and molecular biology. Wiley-Blackwell 2007, pp 17-28. Garrett RA. HP Klenk HP (eds) Archaea: evolution, physiology, and molecular biology. Wiley-Blackwell 2007.